The A2B Route turned northeast on to a service road that follows the Coal Slurry Pipeline. At this point, the trail/road offers a beautiful view of Mount Floyd. The mountain reaches its peak at 7,411 feet. 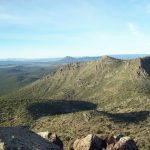 However, it is considered tiny as it ranks as the 440th highest mountain in Arizona. Unintentionally long run this morning. After the standard pre-run stretch, I set out with no route or distance in mind. I had about 1 ½ hours before I needed to be back. So I decided to run a decide-as-you-go random route. I made sure that I had options at each major turning point. Also, because I was particularly lost in thought, I tried to find long roads and paths with minimal traffic. After the second mile, my arms, legs, and breathing felt pretty good. So I let them go on auto pilot for most of the run. I was able to keep a nice, steady pace, in spite of hills. After six miles, I decided to turn towards home. With two miles to go, I had a wild surge of adrenaline and endorphins. With the surge, my stride naturally lengthened and my pace increased to a challenging and uncomfortably fun cadence. I was thrilled and happy as I crossed my finish line. On today’s run, my thoughts were dominated by a dream that I had last night. In the dream, I found myself at the closing ceremonies of a summer camp. As dusk began, the campers, counselors, and staff all gathered in an amphitheater that was set against a beautiful mountain landscape and a technicolor sunset. The head counselor of the camp was retiring after decades of work and service. This was her last ceremony. After all of the awards and recognitions had been given, she stood to address the group. As she spoke, it was clear that she loved the kids and staff. She loved the work. She ended her farewell with a song. The music started with a rich string-filled symphony. I knew the song immediately. It was from a musical. I quietly sang along. In my mind, I could hear all of the vocal harmonies not present in the current performance. In the dream, I quickly remembered the story of the musical. It was about a girl that grew up in a home and culture where love, affection, and passion were not familiar. As an adult, she had moved away. Uncomfortably and nervously, she had watched from a distance as others fell in love. After some time, she decided to try love with a man that she respected. She and the man fell in love more passionately and profoundly than she ever imagined was possible. As time went on, they began to create a life together. As they did, she experienced unbelievable happiness. Then tragedy occurs and her love is suddenly taken from her. This is where the song occurs in the musical. As for the song, it starts off remembering the unimaginable goodness of life with her love. And now, she is immersed in irreconcilable heartache and yearning. A place where there seems to be no solace. Knowing she would never hear his voice again has made her mad with sadness. It was as if the entire world around her was dying, yet she helplessly lives. The head counselor sang the song so beautifully and with a voice full of emotion. It was very moving. I awoke from the dream with the echoes and emotions of the scene, the music, and the memory of the musical. For a few minutes while coming out of sleep, I hummed and sang the song. I, then, started trying to remember the musical from which the song originated. As I tried to recall, I became more awake. Try as I might, I could not recall the name of the musical. It seemed on the tip of my tongue. While stretching, I used my smart phone to Google the lyrics with no success. I tried other lyrics. Again, nothing. I searched key plot points in a Broadway musical. But my phone seemed to have lost all of its smarts. While out on my run, I kept replaying the music and searching in my mind. I had just started thinking that I should ask theater family and friends. That is about the point when it finally dawned on me. I had created the whole thing in my mind. Words, music, story, orchestration. . . All of it. I was speechless and amazed at the fullness and completeness of it all. I suddenly found myself running with unbelievable energy and excitement as I reviewed and replayed the entire dream. I am 51 years old. There is more music in me than I can ever dream. I am filled a new sense of urgency and obligation to create a way to release and realize all of it. Have you ever had a moment where you were able to see just what you are capable of? We’d love to have you share!